Records of la Ville de Thiers, Musée de la Coutellerie publications, The Tourist Office of Thiers, as well as Francis Bentolila, Jean-François Bernardon, Alexandre Bigay, Georges Guelpa, Anne Henry, André Kristos, Brigitte Liaboeuf, Georges Therre, and Jacques Ytournel. 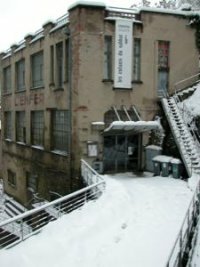 Le Conseil Général du Puy-de-Dôme. 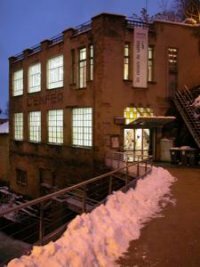 From "The rock of St. Genet" to the "Creux de l’enfer" contemporary art centre. If in philosophy, it is in the mirror of death that life finds meaning, the existence of the Creux de l’enfer would begin with the tragic disappearance of Saint Genet. According to Gregory of Tours, the Saint was decapitated on a highly visible outcropping rock in the Durolle valley, in a place so marked by a torrent that local people called it the Rock of Hell. The Saint has since been associated with water. The imagination of the ancient world, peopled with pagan memories, enjoyed making legends. Whatever the stories, this jutting rock really exists, as did the first workshop that was established at the rock’s base. It was a knife-grinder’s belonging to Jehan Ahon Florat, which had already been established for some time in 1476. It was called ‘Le roc de la fadas’ in the local dialect meaning the fairy rock, with a waterfall at its feet called ‘La chute d’eau de la pélière.’It was this black ithyphallic rock which attracted local valley inhabitants to this austere location. It was also homage to the cantankerous and kindly fairies who haunt the crypt under the waterfall that the whole site was baptised ‘Le gour de la fadas’, the fairy hollow, or ’le Creux de fées’, in modern French. This was at a time when the high and the low, the good and the bad, the sacred and the profane, did not have extensive connotations. However, in the seventeenth century, in counter-reformation times, the creux would be attached to evil, while the waterfall became the devil’s home. In George Sand’s novel ‘Ville noir,’ (written in 1860 it was the first of romanesque tales about the tough working lives of ordinary people in the 19th century, written 25 years before Emile Zola’s Germinal ,) the site is variously called the valley of hell, the hell hole, the holy hell or the fairy way, and was even called ’At the edge of hell’s leap’. As for the rock, it was placed with care under the protection of the headless Saint; a cross was erected on the block’s flat summit. The name ‘Le Creux de l’enfer’ became generally accepted for the whole site. Over time, when the grinding wheel grew into a factory and increased in importance, the construction sacrificed much of the view down to the rock. This still remained, its head sticking out, even if the architecture clung to the rock’s huddling figure. The Creux de l’enfer factory, located near that of de May, was burnt down on several occasions, and always at dusk, as though to confirm the imagination of ordinary people clouded in sulphuric gases. It is said that a woman and child once threw themselves into the thundering torrent in order to escape the licking flames. Other social realities, no less cruel, have been added to the blackness of the myth. In the middle of the nineteenth century country blacksmiths, poor indebted craftsmen were brought into the factories set up all down the Durolle valley. These unsuspecting people discovered a hellish universe. They would live shut up between incandescent ovens, mechanical cutters, shapers, so many drop hammers and grinding clashing springs. The reddening glow of the ovens’ blaze, intense heat, shattering noise, limbs torn in machines, bodies broken by exploding moulds; all added to the exhaustion of production line employment conditions. Workers, women and children who were no longer in possession of their own means of production, hurried hour after hour, day after day in these terrifying blocks of architecture. The workers realised that even the devil would not want to live in this situation. The first devil depicted at the Creux de l’enfer is thought to have been painted on a simple canvas, and fixed against the wall of the factory like a banner or sign. He had the usual attributes of a devil; horns, claw-like hands and a twisting forked tail. He was a great sight over the rough waters of the fall, just below the bridge. Following a major fire in 1934 the façade had to be restored. It was decided to paint a great horny gentleman over two metres tall, (the same image is used as a logo for the Creux de l’enfer today). This Lucifer, this Georgeon, a traditional name for the devil, this Evil of somewhat androgynous make with its delicate profile, was painted by Louis Guelpa and his brother, handy local decorators from Thiers. To reach the exposed façade for their painting, the brothers had to build a scaffold perched on the edge of the roof in a precarious seesaw balance; weighted down by some boxes stuffed with cutlery. But legend was confirmed during the restoration works, the sky darkened, a clear midday light took on that worrying colour of black ink. A gale swept through the valley gorge, tearing of roof tops and factory chimneys. People took shelter just in time. The painters’ scaffold was swept into the river waters, ... but the devil had already been painted! Some years later, at the beginning of the Second World War, American made machine guns were tucked away as part of the secret armory of the French navy. 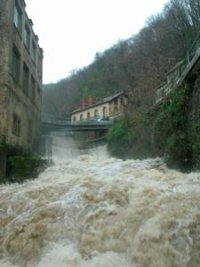 In the basement, ammunition belts would be checked out each time the river Durolle swelled; the pounding noise of the waters would cover the noise of explosions. Even though the Germans occupied the region in 1942 and the factory was requisitioned, seventy-five Resistance radio transmitters were hidden inside. From 1956 onward, when the red devil was still visible on the façade, the factory was abandoned. Many other factories in the valley had also closed down; electricity and larger plants were replacing the unpredictable Durolle and hydraulic power. So for a further thirty years the building was left derelict, to the fairies, tormenting a poor lonely devil that finally disappeared. In 1985 a national symposium on monumental metal sculpture was organised by the town of Thiers. It was an occasion for the six regional and international artists,Yves Grin, Michel Gérard, Dennis Oppenheim, Patrick Raynaud and Vladimir Skoda, to work with local craftsmen on the production of their works. The sculptures were to be a fine addition to the context of the town and its surroundings. The sixth artist, George Trakas, foresaw the future of the Creux de l’enfer. Just like the hero of a Jules Verne novel, he would lower a metal footbridge at water level, a real suspension bridge swinging in the spray, crossing the flow. In the sheer heroism and play of this act, it was a way of bringing the site’s social history and legends together with the art of George Trakas’ times. The bridge was also a way of associating the know-how of craftsmen with how the thinking artist knows. A utopia, to borrow from Robert Musil, which has nothing unreal about it once it is realised. With the success of the Symposium a new challenge was set, to unite the industrial architecture of cutlery with ongoing creative activity. A marital union surveyed by the town hall, and a town hall which grew fond of the Creux de l’enfer’s symbolism, and hurried to purchase the site in 1986. 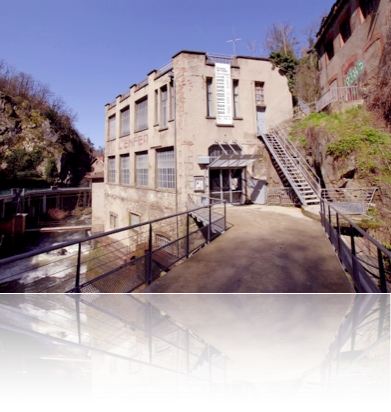 The following year the town council undertook a refurbishment of the Creux factory with the intention of turning it into a tool for cultural development, assisted by the Ministère de la Culture et de la Communication, the regional arts council or DRAC Auvergne, and the Conseil Général de Puy-de-Dôme. Thiers entrusted the architects Xavier Fabre and Vincent Speller to restore and restructure the building, with the guidance of Francis Bentolila, the first director, to restore and restructure the building while respecting its industrial past. It is a history that condemns the founding stones and the austere façade, still marked with the letters of hell. This is the moment of abandon, of all stale beliefs, to unknown forms of emotion in art today. In his work Saint Genet: Actor and Martyr, Jean-Paul Sartre evoked the strange hell of beauty, a beauty that fills as much as it clears its own fall in each of us. The Durolle has shared her energies with so many craftsmen and workers that she no longer weeps over the spinning wheels, gone. She keeps the vital water of her tears to turn the wheel of her memory over new dawns of understanding. A great wheel round which over one hundred artists have turned their interventions. A dawn for each artist who has been to Thiers, each lending his palette to the movement of its charge, all gates open to the becoming of le Creux de l’enfer. According to Gregory of Tours, Saint Genet, or Genest in old French, had come from the East, sent by his mother, to serve Saint Sirénat. Gregory of Tours further recounted that Saint Genet was tortured and then decapitated on the Creux de l’enfer rock because he had hidden the hiding place of his master. In 575, when a labourer from Thiers, in the very same place, miraculously discovered Saint-Genet’s body, Saint Pontif Avitus had a wooden church built over the burial place to hold his remains. In a parody of the Roman emperor Diocletian’s own Christian ceremony, he was believed to have received divine grace just before his death. This story was taken up by the playwright Jean De Rotrou in ‘Saint-Genest,’ (1646). Rebuilt in 1107, devastated by Protestants in 1568, the edifice still carries the name of the martyred saint, and it represents a major example of Roman architecture with the biggest central arch in the Auvergne region (101m2). The cult of Saint genet seems to have settled in Thiers until the middle of the 1èth century, when Louis d’Estaing extended its influence to include the diocese of Clermont-Ferrand. The cult’s holy day, initially the 28th October, was advanced to the 29th in order to take account of the Christian calendar. Around 1900 local clergy organised a procession around the site, and a cross was planted on the summit of the rock. It may be noted that a relic of Saint Genet is in Fontevraud Abbey, whose own walls became a sinister prison under Napoleon Bonaparte. The author Jean Genet was inspired by the Abbey to write his novel ‘The Miracle of the Rose,’ while Jean-Paul Sartre studied the depths of the author in his work ‘Saint Genet, Actor and Martyr.’’ The first paragraph of this book is entitled, “The sweet child in me dead before the axe falls,”a clear reference to Saint Genet, while another title runs, “The strange beauty of hell.” ‘Une pélière’ is a natural dam which blocks a river. Beneath the Creux de l’enfer, legend would say that a cave hides a golden goat and a statue of the Virgin Mary. ‘Du May,’ read ‘Mailh’ or ‘moulin à fer,’ (iron mill). Source; A. Kristos “Le forgeron.” French grammarians did not make the distinction between craftsman and artist or artisan and artiste until the middle of the 17th century and the founding of the Académie Royale de Sculpture. Francis Bentolila directed the art centre in the beginning, and from then until 1999 by Laurence Gateau.